Malcolm McDowell is $74, as are Jeri Ryan and Danny Trejo. 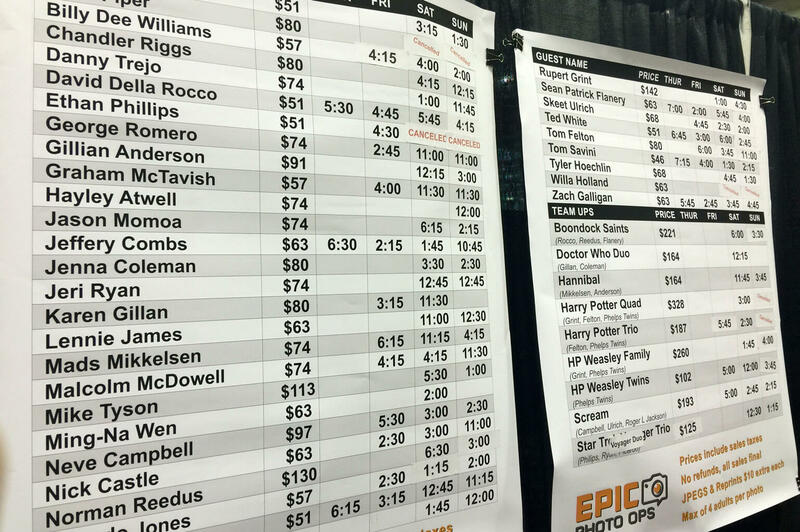 Ming Na Wen, Jeffrey Combs, and Zach Galligan are only $63 apiece. And poor Billy Dee Williams is priced to move at an embarrassingly low $57, a paltry sum for an actor associated with the Star Wars franchise. 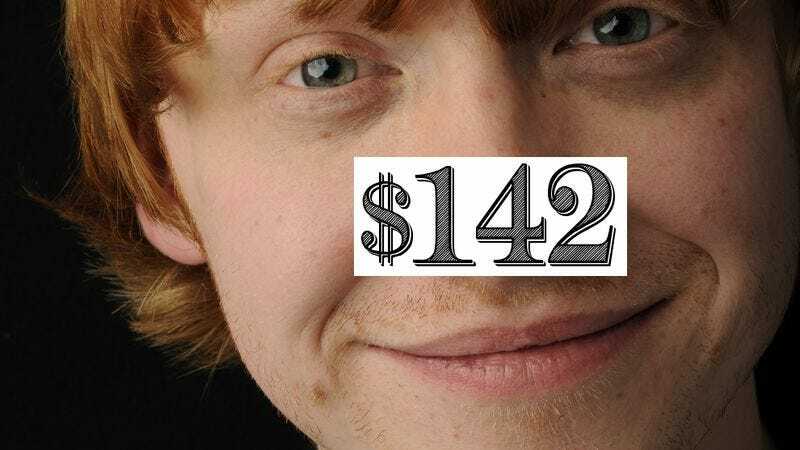 But Rupert Grint, beloved by millions for his role as Ron Weasley in the Harry Potter films, stands above them all at an impressive $142. These are the kinds of cold equations that Canadian journalist Jonathan Kay encountered when he recently took his daughters to the 2015 Fan Expo Canada, a large convention devoted to video games, comic books, anime, science fiction, and other nerdy pursuits. He wrote all about his experiences in a fascinating, web-exclusive article for The Walrus tellingly titled “Ron Weasley Made Me Sad.” The prices quoted above are what it costs to have one’s picture taken with said celebrities, described by Kay as “stars and quasi-stars.” The more in-demand a celebrity is, the more expensive his or her image. This is, the writer says, a “process that any commodities trader would recognize.” Kay’s article includes a heartbreaking shot of a board with the names of celebrities and their respective prices. Kay explains that he didn’t necessarily want to plunk down a sizable chunk of change to pose with Rupert Grint, but his daughters were die-hard Harry Potter fans, and he didn’t want to be a bad dad. At least, he says, he could easily afford it. The same could not apply to other convention attendees. “Most of the money being spent here, I’d wager, had been earned at minimum wage,” he writes. Jonathan Kay’s article provides some insight into the somewhat shadowy netherworld of fan conventions, which strive to create an inclusive, welcoming, “free-to-be-you-and-me conceit” but may ultimately leave attendees feeling “sad and hollow,” not to mention several hundred dollars poorer. Even though Kay specifies that “Fan Expo and the Weasleys were scrupulously honest,” the writer still felt like he’d been a sucker, an easy mark. This, he attests, is the dual nature of geek culture. Ultimately, despite all the feel-good rhetoric, this is a business with money to be made. These actors and actresses, many of whom have ties to horror and sci-fi franchises, are professionals with bills to pay and mouths to feed. Those who read Jonathan Kay’s piece and find it upsetting or unfair are also encouraged to read the comments below it, as there is a spirited and thoughtful discussion among readers about the realities and ethics of fan conventions. One happy insight? Jamie Lee Curtis is awesome in person.